Peeps are an Easter tradition in the US and Canada. People go mad for the neon-coloured, sugar-coated marshmallows, especially during the holidays. Their fun shapes – chicks and bunnies – make them popular among kids even though the fluffy candies are the furthest thing from tasty, rather like a sugary bit of couch cushion than the real deal. As any food manufacturer is wont to do, Peeps comes out with unusual flavours as holiday exclusives. With Easter just around the corner, the time has come for these seasonal goodies, only this time Peeps has gone an entirely new direction. Peeps Oreos don’t sound the least bit appetising. Chemical-laden and bright pink, these cookie-marshmallow mash ups have been reported to colour the tongue. 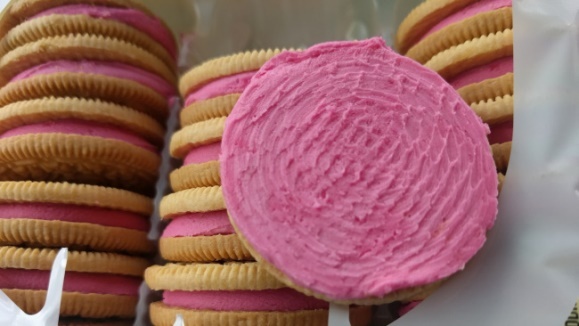 According to Live Science the crème filling’s pink colour is achieved with FD&C Red No. 3, a food dye that cannot be broken down by the body. Dr Ian Lustbader, a gastroenterologist at New York University’s Langone Medical Center, said that the artificial colouring goes through the digestive tract as a slightly-diluted pink before coming out a darker shade. He claims that a couple cookies won’t affect the body’s natural colours, but an excessive amount will. The dye in question, FD&C Red No. 3, has been a sore point for health experts in America for years. It has questionable effects on the human body having been linked to breast cancer, thyroid tumors and hyperactivism in children. The Food and Drug Administration (FDA) banned the dye from use in cosmetics and external drugs in 1990, but claims that no health dangers have been shown during its regular safety reviews in relation to human consumption. Confusingly, the FDA acknowledges that the dye is a thyroid carcinogen. Several dyes have been banned on the grounds of cancer – Red dyes No. 1, No. 2 and No. 4. FD&C Red No. 3, however, is still widely-used in the US food industry today. Peeps Oreos may be the nudge the FDA needs to ban FD&C Red No. 3 from use in food products. 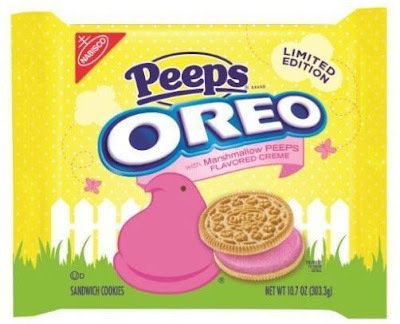 People on social media have said that the Easter Oreos changed the colour of their tongue and saliva for at least 24 hours! Hearing that, one wonders just how many Oreos they ate in one sitting.